via Environmentally induced quantum dynamical phase transition in the spin swapping operation | Browse – Journal of Chemical Physics. Quantum information processing relies on coherent quantum dynamics for a precise control of its basic operations. A swapping gate in a two-spin system exchanges the degenerate states ∣↑, ↓⟩ and ∣↓, ↑⟩. 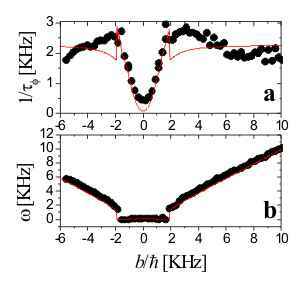 In NMR, this is achieved turning on and off the spin-spin interaction b = ΔE that splits the energy levels and induces an oscillation with a natural frequency ΔE/ℏ. Interaction of strength ℏ/τSE, with an environment of neighboring spins, degrades this oscillation within a decoherence time scale τϕ. While the experimental frequency ω and decoherence time τϕ were expected to be roughly proportional to b/ℏ and τSE, respectively, we present here experiments that show drastic deviations in both ω and τϕ. By solving the many spin dynamics, we prove that the swapping regime is restricted to ΔEτSE≳ℏ. Beyond a critical interaction with the environment the swapping freezes and the decoherence rate drops as 1/τϕ∝(b/ℏ)2τSE. The transition between quantum dynamical phases occurs when ω∝ becomes imaginary, resembling an overdamped classical oscillator. Here, 0 ⩽ k2 ⩽ 1 depends only on the anisotropy of the system-environment interaction, being 0 for isotropic and 1 for XY interactions. This critical onset of a phase dominated by the quantum Zeno effect opens up new opportunities for controlling quantum dynamics. Decoherence rate and oscillation frequency in the spin swapping of a 13C-1H system. 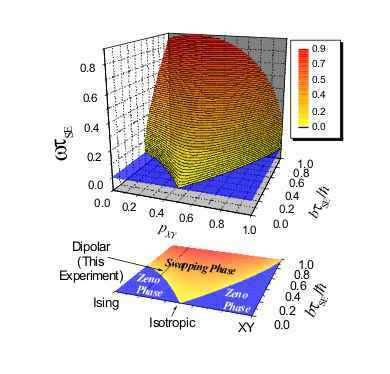 Data points are obtained from cross polarization experiments. The zero plateau in the frequency and the parabolic behavior of the decoherence rate are indicative of an over-damped Zeno phase. Solid lines are the prediction of our model.